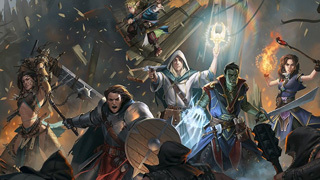 Owlcat Studios has enlisted Chris Avellone to write the new RPG based on the Pathfinder tabletop game - Pathfinder: Kingmaker. If you've been around tabletop gaming in the last eight years, you've likely heard of Pathfinder. Paizo's RPG began as a modification for the Dungeons & Dragons 3.5 ruleset, and has since grown into a game all its own. Now a new studio, Owlcat Games, is working on an isometric CRPG based on the Pathfinder rules, and it has brought in none other than Chris Avellone to help write it. Pathfinder: Kingmaker is set in the Stolen Lands, a setting familiar to players of the tabletop game, and will feature many characters and locations from that setting. You'll be able to take and hold territory, and even establish your own kingdoms. Owlcat says that this feature, "will go beyond simple stronghold-building to become a true reflection of the hero's character and choices made throughout the game. Each kingdom will be a living thing shaped by alignment, choices, allies and the hero's ability to lead his or her people." Speaking about the project, Chris Avellone said, "I'm a Paizo fan, and a Pathfinder fan. I like the setting, the art style, the adventure paths, the card game, and the iconic characters. I've enjoyed playing Pathfinder with my friends (we used to be part of an Ocean's-11 style game), and I've enjoyed the comics, the world, and the overall setting. I'm excited by the prospect of bringing Pathfinder to the computer RPG world, and hope gamers will enjoy playing in the Pathfinder universe"
It sounds like it is very early days for Pathfinder: Kingmaker, but the announcement comes just ahead of PaizoCon 2017, which will be held next weekend in Seattle. We should hear more about the game then, but for now you can check out the official Owlcat Games website for more information. Let's take 3x and magnify all its warts to appease the neckbeards who didn't like 4th. I guess that Pathfinder MMO they were talking about a couple years back fizzled out. No real surprise there. Kingmaker is renowned as one of the best adventure paths they have ever put out, so hopefully this works out. Pathfinder is one of the worst tabletop systems presently out there, and its setting is even worse. I have faith in Avellone to get something good out of it, but I have no idea what he supposedly sees in it. Why is it one of the worst? I happen to play it, but am genuinely curious why you think that? It is as Souplex says. All of the flaws of 3.x are magnified greatly, despite claims to try and fix those issues. I have a lot of issues with the game. I don't like how at higher levels, modifier bloat and DCs make the roll one of the less important aspects of skill checks. I don't like how the game consistently shafts martial characters in the best D&D tradition, making them objectively worse choices to play than any magic class since a mid to high level wizard can do anything a Fighter can do (in itself very little because of a lack of meaningful options) with spells. I don't like how a constant stream of material has created so many options for character development through classes and feats, much of which is broken or clunky, if you can overcome the choice paralysis in the first place that the game has become a game of builds and charop. I don't like how monster balancing is broken, with monsters ranging in power wildly within the same challenge rating.I don't like how the game has no sense of its own identity. It proclaims to be about heroic, larger than life heroes but tries to emulate real world physics (poorly). They once nerfed weapon ties because one of their writers spent half an hour wrapping their mouse cord around their arm and trying to catch the mouse and found it too difficult. I especially dislike the setting, which is admittedly not as much of an issue since most people I know use their own settings for games, because it embodies all of the bad kitchen sink tropes I've come to hate. Individual regions can be interesting, and a number of the adventures are pretty strong, but everything exists in this strange stasis where barely anything interacts with other regions, and wildly contradictory cultures and geographical regions sit next to each other without interaction. You can certainly still have fun with the game, and you can make good things from the setting. But you'll be fighting against what's there the entire time. It's better to find a system that has a better idea of what it wants to be and has a more solid mechanical base for whatever style of game you want to run. Any connection to the official Neverwinter Nights module Kingmaker? I don't have a rebuttal, Pathfinder is so far the only rpg I have really played, I enjoy it but some of what you're saying certainly rings true to me as well. I don't have any real experience with other systems to compare it to. I have bought some books for FFG's Star Wars RPG, it has a very different system, I have played a couple one off scenarios recently and I think I like it, so we'll be playing that soon too. I'll ask the obvious question: IS IT TURN-BASED? Because that's been my biggest problem with games like Neverwinter Nights and Baldur's Gate is they're not turn-based, despite being based off Dungeons and Dragons. I'm a pretty big fan of the FFG Star Wars system. It really nails the adventurous feel of the setting, and I think the dice system is pretty neat. If you're looking for a game that has a more cohesive ruleset and does sword and sorcery really well, check out the system called Mythras. It's a percentile system, and you can download a big honking free version called Mythras Imperative. Great combat, and a lot of interesting magical options. The Classic Fantasy book brings it even closer to something like D&D. Or if you want something more focused on melee combat, there's a game called Song of Swords that I've been really enjoying. There's a free beta test on their website, but be warned it's sort of rough in both layout and some of the rules. Hey, that's what playtesting is for. Branch out. There's a whole world of games out there, and one of them is sure to fit what you want. Yeah, the narrative dice system is really cool. Part of what drew me to it, also the way character progression works seems really straight forward. I was thinking of looking at D&D 5th as the next fantasy one, since I'd be able to convert some of the Pathfinder stuff I have and still make use of all the books and stuff I have for it. Pretty much have most of the hard backs xD That said, we still enjoy it, so as far as generic fantasy goes, might just stick with it, since we know it and play it fast. I also have some interest in Shadowrun too, so there's another very different kind of game too. There are many flaws with Pathfinder but I'll stick to the five that made me stop playing and running it. 1) It's not very well balanced. Some classes are very weak, others are very powerful. The same goes for races, feats, equipment, and other character options. There are many options that are strictly worse than others or just plain bad choices. Spellcasters are widely viewed as being too powerful and versatile compared to non-spellcasters, especially at higher levels of play. 2) Some classes are much more versatile than others without losing anything. A Fighter is good at sword-fighting and nothing else, they have few skills and their feats need to be invested in combat prowess in order to remain effective. A Sorcerer can contribute just as much to a fight but also has a number of interesting options outside of battle in the form of spells. It's frustrating when the limited 'specialist' character isn't any more impactful than his team-mate who has ten times as many interesting options at their disposal. 3) Character creation takes too long even if you know what you're doing. There's a ridiculous number of options, and even if you restrict character creation to Core + X, Y, and Z you're looking at dozens of races and classes, hundreds of feats, and possibly thousands of spells. Sifting through all that is tedious even if you know exactly what kind of character you want to make. 4) It's not beginner-friendly. There are lots of complicated rules, the rules for character creation aren't particularly great, and it all comes off as very intimidating to people new to the hobby. You don't really know what's a good option or how things really work until you're a few sessions into the game. 5) It doesn't bring anything new or interesting to the table. Pathfinder is just more D&D 3E content under a different name and a different publisher. It lacks the innovation and mad spark that even bad indie RPGs have. A bad tabletop game can be great because it tried something different and failed. I can take something from a bad game and find a way to fix it or apply it to my own games. Pathfinder doesn't have this and, by its own nature, it never will. In my view, a good TTRPG is something new and different that's easy to learn, easy to make a character for, and has good balance between characters when it comes to their versatility and overall power. Pathfinder lacks all of those qualities and that's why I haven't played it in years. About bloody time. I've been waiting and waiting for a Pathfinder cRPG for years and I don't understand why it wasn't forthcoming sooner. DnD 3.5e was a great ruleset and the games it did give us on PC were great, but too few. MORE. So... they're just making the kingmaker modules then? With Avellone I would expect childish sexual situations and not much else.